My mom and I discovered the beauty of homemade biscotti last year with this candy cane biscotti, and this year we decided to try another version with two of our favorite flavors — chocolate and hazelnut. 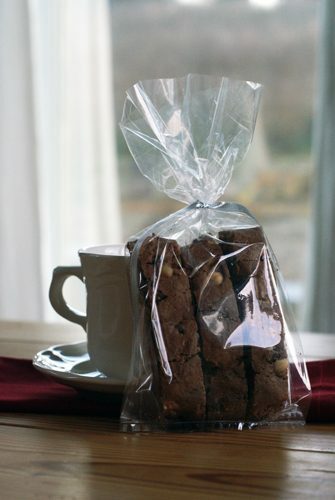 Serve this at a Christmas brunch or package it in a treat bag as a teacher gift. Or sit and enjoy it each morning as you take a few minutes to reflect on the joy of the season rather than the stress! Preheat oven to 350 degrees F. Cream butter and sugar together in a large bowl at medium speed. Add eggs and vanilla and continue beating until blended. Slowly add flour, cocoa and baking powder, beating on low until completely mixed. Add hazelnuts and chocolate chips. Dump dough on a floured surface and divide it in to fourths with lightly floured hands. Shape into 1-1/2 inch wide logs. Place logs on a lightly greased cookie sheet — with room to spread — and bake for 18 to 20 minutes until the edges start to brown. Reduce oven temperature to 325 degrees F while the logs cool for 10 minutes. Cut logs into 1/2-inch slices with a serrated knife, discarding the ends. Arrange the pieces on the cookie sheet with the cut side down and bake for an additional 12-14 minutes, turning once. Cookies should be lightly browned and crisp. Move cookies to a cookie rack and let them cool completely. 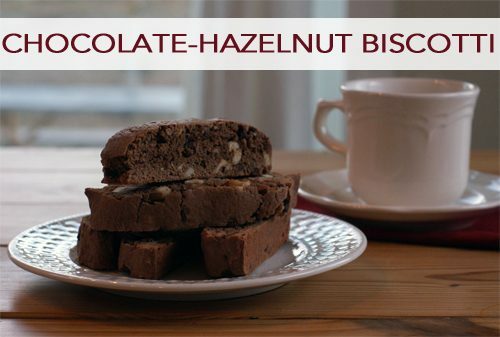 Optional: Melt almond bark and carefully dip the biscotti halfway in the coating, letting the excess drip off. Place on waxed paper and allow to harden at room temperature.